This year marks the 30th anniversary of Journey of Hope as an Ability Experience program. In the early years of the organization, The Ability Experience provided support for those with disabilities through projects that while innovative, only provided limited opportunities for men of Pi Kappa Phi to be hands-on with those they served. By the mid-1980’s, the organization was seeking ways to engage students with needs in their own communities. 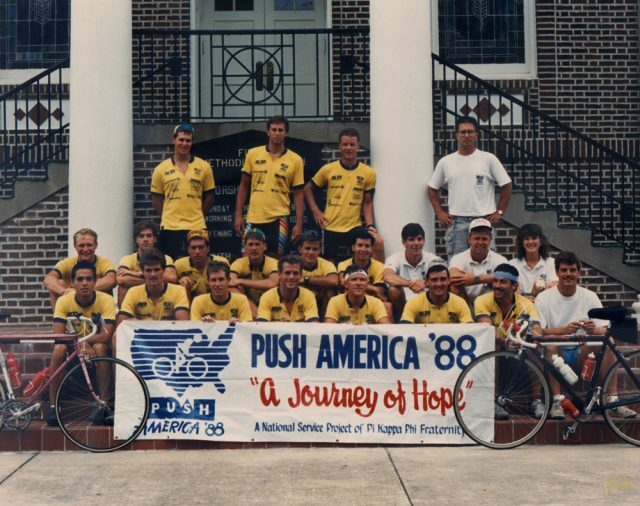 In 1987, Bruce Rogers, a recent graduate of Stetson (Chi Chapter) reached out to inform staff that he planned to cycle from the Pacific Northwest to the east coast in order to raise funds and awareness for the organization. This inspired Ken Kaiser, then Assistant Executive Director, to consider the possibility of a program that could replicate his efforts. After Bruce Rogers’ solo trip across the U.S., Ken Kaiser lobbied the board to establish a team event. He began working with Jim Karlovec, then an undergraduate from his alma mater – Bowling Green (Delta Sigma Chapter) to plan what would become ‘Push America: A Journey of Hope’. With the help of Sally McArdle, another student at Bowling Green, and John Pierce, recent graduate of Florida State (Beta Eta Chapter) they began planning a fully-supported team cycling trip across the southern United States, a rare undertaking for its time. Nineteen Pi Kapps from twelve different chapters answered the call to pioneer this new program, some with little to no cycling experience before signing up. While they encountered many challenges along the way, the team successfully trekked San Diego to Washington D.C. in the summer of 1988. Along the way, they were able to raise over $50,000 and awareness through local media and visit with several of the facilities that had received the Play Units provided by The Ability Experience including Lubbock State School and Holy Angels. Their hard work proved that the program could successfully bring together men of Pi Kappa Phi from chapters across the country to safely cycle across the nation while raising funds and awareness for people with disabilities. 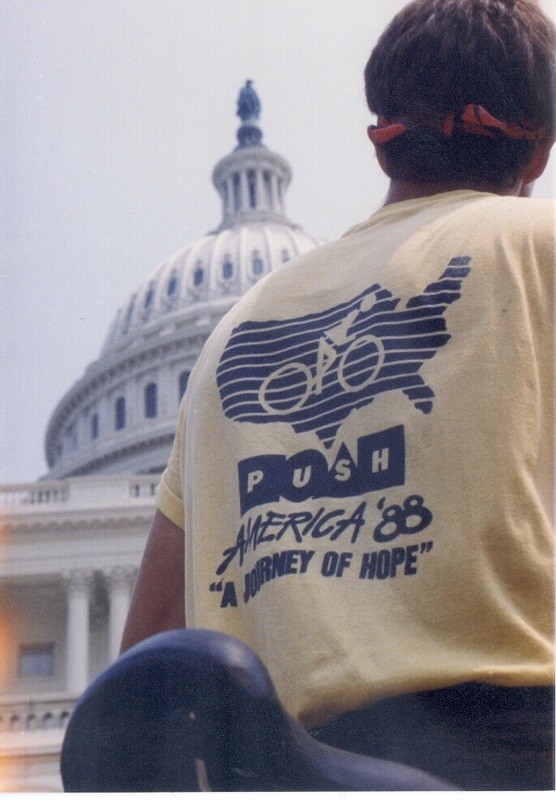 Just as Bruce Rogers’ 1987 solo trip was the inspiration, the 1988 team ride was a proof-of-concept that would then become a sustainable program with the 1989 trip from San Francisco to Washington D.C. Since that first team’s trek across the South in 1988, over 2,000 men have completed Journey of Hope, raising over $12 million in the process. Not only did Journey of Hope become a flagship program of The Ability Experience, but it also marked an important shift in how the organization carried out its mission—giving members the chance for more hands-on opportunities to serve people with disabilities than ever before. Since Journey of Hope’s inception, new team events – Gear Up Florida and Build America have been created to spread the opportunities for impact.